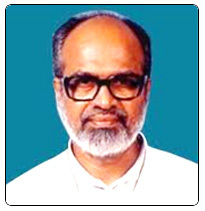 Bishop Vijay Anand Nedumpuram was born on 24 September 1938 in the parish of Cherpunkal, in the eparchy of Palai. After his school education in Palai, he joined the CMI congregation as an aspirant in 1956 at Mannanam. He had his novitiate at Chethipuzha and Philosophy and Theology at Dharmaram, Bangalore. He made his first profession on 16 May 1959 and Final Profession on 16 May 1962. He was ordained priest on 17 May 1967. After his ordination he did his MSW from Bombay in 1971. From 1971-78 he was the Vicar General of the Exarchate of Chanda, from 1978-84 General Councillor and Vicar General of the CMI Congregation. In 1984 he was elected Prior General of the congregation. He was appointed bishop of Chanda on 20 April 1990 which was made public on 15 May 1990. His ordination as Bishop took place on 3 July 1990 and was installed as Bishop on the same day with the motto of Viswa Kutumb (Universal Family).